In the wake of a deadly tornado that destroyed parts of Van, Texas, a week ago, a dog was found curled up with her dead owner David Tapley, a retired police officer, and nearby his wife, Brenda. 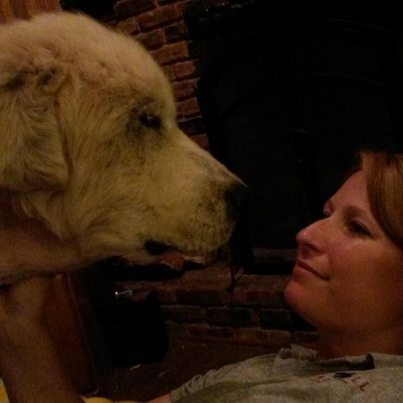 The Great Pyrenees, thought to be about 8 years old (solid information about her previous life, including her name, is hard to come by), is banged up, emotionally and physically. She's showing signs of shock; her skin is raw and bruised. She has some head trauma, and is now deaf in one ear from a burst eardrum. But, rather miraculously, she's alive. She has a new name -- Emma -- given to her by a new family, who themselves have one new goal: to help this dog heal. "My mom and I agreed that we would set her birthday at her survival date. That is the day her life changed. It helps us honor the lives of her owners that perished in the tornado," says Michelle Shockley, who, along with her parents, has adopted Emma. "Trust me, I cry a lot." Emma wasn't David and Brenda Tapleys' only pet. Five others -- along with a dozen-odd other animals affected by the tornado -- were brought from the devastation in Van to a horse farm about 20 miles away, where they're being taken care of by the group Nicholas Pet Haven. "She has the saddest face and is absolutely traumatized," says Nash. "You can't help but cry when you look at her and just want to sit and hold and love her." Shockley, who goes by Missy, saw Emma arriving at the dogs' temporary shelter and felt an "instant connection." 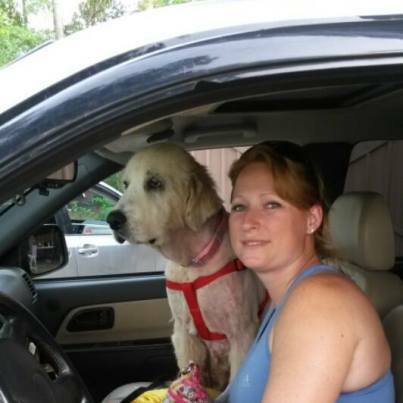 "I crawled up into the pickup bed and opened the crate and started loving on her," says Shockley. "Within a minute, she had come out of the crate and laid in my lap." They brought Emma home, as soon as legally able (it took a few days after the tornado to sort out which pets had folks coming back for them). Dr. Gary Spence, of Spence & White Veterinary Hospital in Tyler, Texas, tells The Huffington Post that what Emma and the others went through is devastating. On top of being medically injured, "everything they know is just gone," he says. But having examined her shortly after her rescue, Spence believes Emma -- with enough time and treatment -- is going to recover. "Emma's going to be OK," he says. Shockley and her parents are determined to see it so. Emma doesn't have much of an appetite yet, and mostly just wants to sleep, on a big comfy dog bed piled high with blankets. She doesn't yet like going outside unless someone is with her. She's got a lot more veterinarian appointments ahead of her, including one today, to try to make her skin a little less raw. But Emma's warming to the other family dog, a little pit named Bentley (though still seems befuddled by the cat). Shockley thinks that the doggie is even "starting to recognize her new name." Emma's recently wagged her tail a little, and shown some interest in treats, too. They're small steps in the scheme of things, but huge to the people who know what Emma lost, know what she experienced -- and love her very much, just a few days into being her new family. "She deserves anything she wants," says Shockley, who encourages others to adopt and foster rescue pets as well. "I believe all animals deserve that second chance at finding a happy life." Nicholas Pet Haven is looking for more foster and permanent homes for animals affected by the Texas tornado. Find out more on the group's website and Facebook page. Folks who want to help financially instead can donate here.